You are here: Home / Our Animals / Chickens / Why Are My Chicken’s Feathers Falling Out? Why are my chicken’s feathers falling out?!?!? This is one of the biggest questions I get from concerned new chicken owners. Freaked out over feather loss? There are many reasons why your chicken’s feathers might be falling out. I’ll go through some of the main ones today and give you tips on what you should do. So, chickens molt. And it’s a very common reason why chickens lose feathers. In case you don’t know, molting is when chickens lose feathers and then those feathers are replaced by new ones. 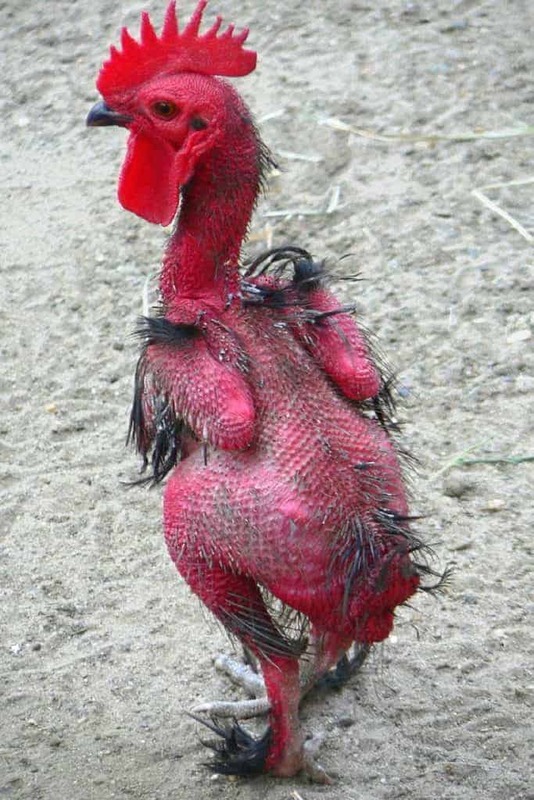 I love chickens, but they just aren’t that good looking when they’re going through a rough molt. It’s messy, ugly, and a little bit uncomfortable as the feathers grow back. The molting process can be scary for first time chicken owners, but realize that your chickens losing their feathers in a molt is a normal process. If you want, you can feed them a high protein treat (like BEE A Happy Hen, which we sell in the store) to help them stay healthy and regrow their feathers. Another reason your chickens could be losing their feathers is because they aren’t getting enough protein. This can happen if you’re feeding your chickens scratch or letting them forage for their food. 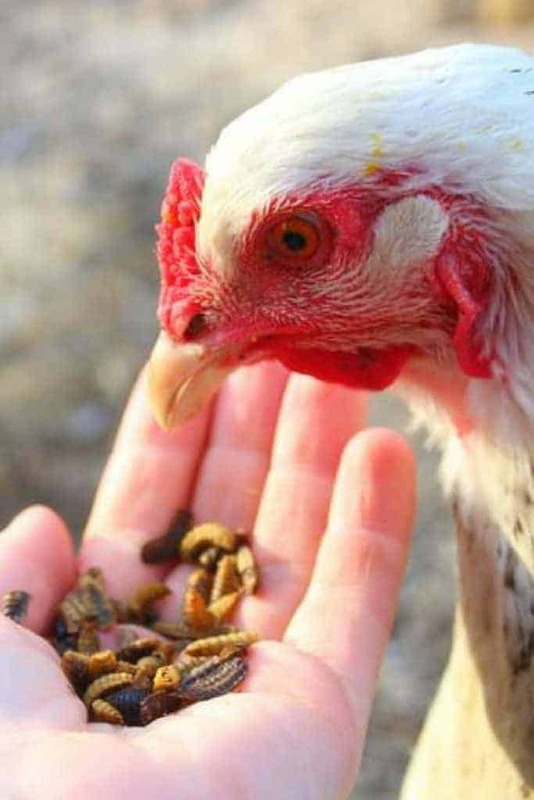 Even if you allow your chickens to roam around the yard and they’re finding and eating bugs as they do so, you need to make sure that you are also providing them with access to feed that is nutritionally balanced and has the appropriate amount of protein. If your chickens start losing their feathers without an explanation (such as molting), then evaluate their diet and feed that you are providing. Provide more protein!!! Start incorporating black soldier fly larvae (we sell them in the store right here – use coupon code FEATHERS to save 10%) or mealworms (use coupon code FEATHERS to save 10%) into your chickens diet – you can mix it with their feed or give it as a treat (we have lots of treats in the store with dried insects for just this reason!). Plus chickens LOVE them (like….really love them, LOL!) so they will eat it happily! If you want to raise them yourself, it’s easy to start a mealworm or black soldier fly larvae farm! One reason your chickens might lose their feathers is from picking, which is usually caused by environmental stress such as over crowding or bullying. Think of it as a reaction to anxiety. Bullying among chickens CAN happen (personally, we’ve been lucky and not experienced this in our coop, but yours might have an alpha hen who picks on a more subservient hen). Every coop has a social order and particularly if the flock as a whole is stressed or the “picked on” hen is new, chickens will sometimes peck the victim until she’s lost her feathers. Or your chickens could also be stressed and so they begin picking feathers of other hens in the coop to deal with that stress. The simplest thing to do in this case is figure out why your chickens are stressed and try to remove the problem. If they’re over crowded (10 square feet per chicken in a coop is a good guideline), then give them more room. If they’re bored, then provide environmental enrichment such as treats they have to “hunt” for, swings, branches for them to fly up to (this can also give them more room), places to hide, etc. One popular idea is to put a treat such as cabbage, carrots, tomatoes, or cucumbers on a string and allow your flock to peck at it. If your flock has a bully, then you can remove the bullied chicken from the coop and isolate her from the flock (give her a friend since 2 chickens together are likely to bond since they only have each other for company). You can then try to reintroduce everyone a few days later or continue to keep them separate. If your chickens lose feathers still, then you should figure out if the problem is something else. Chicken’s may also be picking their feathers due to broodiness. Some chickens get broody (i.e they really want their eggs to hatch) and so they’ll sit on their eggs for long periods of time and often pick their own feathers and lay them around their eggs for warmth. If you want your hen to hatch the eggs, then let her do it, and understand she’ll stop picking her feathers after the chicks hatch. If you don’t want her to hatch chicks, then break her broodiness. She should stop losing feathers because she’ll stop picking at herself. Yuck. I hate lice and chicken mites, and they can definitely cause your chickens to lose feathers. Now, you might say “I don’t see any mites on my chickens” and assume the issue is something else. I hear this a LOT from chicken owners trying to figure out feather loss. Even though you might not see mites on your chickens, they can still be the source of your trouble. Mites are sneaky. They hide in corners of your coop and then come out at night and infest your flock. And eventually, they can cause more than feather loss – they can cause your chickens to lose the scales on their legs and eventually death as they rob your hens of nutrients. Even if you don’t think mites are why your chickens are losing feathers, you can still preemptively clean your coop and use herbs such as peppermint and cinnamon and diatomaceous earth to keep mites and lice away. If you don’t know, diatomaceous earth is a powder that your chickens can bathe in. It has been shown in scientific studies to reduce the number of mites and lice in chickens because it’s sharp edges cut the exoskeletons of insects, causing them to die. However, I highly recommend that you only use DE in well ventilated areas, and keep your flock out of the coop while you’re spreading it about (a little goes a long way)! Chickens have a very delicate respiratory system, so you want to be careful that they don’t inhale it on a regular basis. If you don’t want to bother with DE, you can just use herbs. Mint repels insects, so hanging peppermint around the coop or nesting box is a great way to get rid of or prevent a mite infestation. Another reason your chickens could be losing their feathers is vent gleet, which is a fungal infection in the vent (where your chicken expels waste and eggs) and it can cause some pretty nasty whitish/yellowish discharge along with a loss of feathers. Think of it like a yeast infection. It’s gross and it’s definitely not good for your chicken! 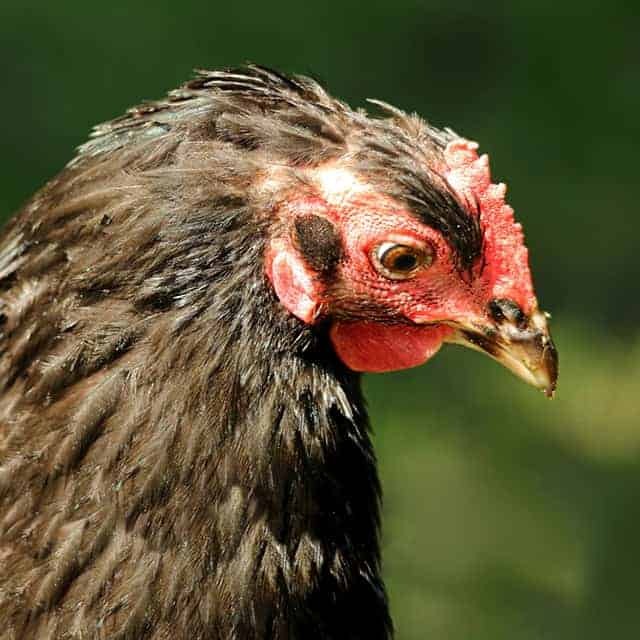 If you think your chicken has vent gleet, then the best thing to do is take her to the vet, who can give you medications or make recommendations for all natural solutions. One way you can help prevent vent gleet is to ensure your chickens have good gut health! You can do this by adding some apple cider vinegar (about a tablespoon per gallon) to your chicken’s water. We sell apple cider vinegar granules in the store – they’re shelf stable and easy to add to water or feed. So roosters like to mate. A LOT. It’s normal and part of a flock’s social dynamics. If you notice your hens are losing feathers on their back (and only their back) and you have a rooster, you can be pretty sure the issue is overmating. This isn’t to be taken lightly – I’ve seen cases where roosters were overmating hens to the point where the hens lost not just their feathers, but the skin on their chests – which, of course, is a much bigger issue than losing feathers. In summer, this can end in a bad case of fly strike, and you might have to put your hen down if it’s bad enough. Fly strike is notoriously difficult to get rid of, and treatment – which consists of picking maggots off your hen’s body and removing dead tissue – is painful and difficult, and a lot of animals simply die of shock). Roosters stand on top of hens backs while they are mating and they can cut your hens or cause them to lose feathers. If this happens you might need to separate the roosters from your hens to keep your girls safe. If the issue is only feather loss (and not skin loss), you can also use a chicken saddle, which will cover the bald area. If you have multiple roosters and see them excessively bickering over the hens, then it’s time to either give each rooster his own flock of hens, or re-home one of the roosters. If you have multiple roosters and notice one rooster is losing feathers on his back, then it’s time to separate him from his “prison buddy” if you get my drift. (Yes, this is a real thing that can happen because it’s about social dominance and their pecking order). My Welsummer rooster has been in moult a long time. has his tail feathers but the rest are taking long time. Eating well, as for servicing my girls, yes he is very active.Would love to see his feathers. Thanks. Hi Ruth – extra protein will help. Sometimes, they just take a while though! We have one that’s still regrowing feathers from roosters mating over the summer. And we had another one grow all her feathers back in 2 weeks!